Akira, a girl touched by the scent of England’s breezes. Even though the weather is often bad, I don’t hate the town where I was born. The cityscape, built of brick, is beautiful and we can see a lot of cats when we walk outside. But now, my heart is excited about a new life, in a new town. Maybe that’s because of her singing voice, which I heard in the live house where I went the other day. Catching up to her and even going beyond her. That should be my new goal in Akihabara, the town where I will live from now on. 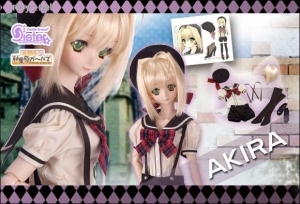 Finally ‘Akira’ has made her debut as a Dollfie Dream®! She won the top prize in the “Recruiting a New Character for the “After School Akihabara Girls”! !” as a part of the DD 7th Anniversary Seven Special Commemorative Projects! Please look forward to the future of the “After School Akihabara Girls” which is expanding even further with a new member! Mimiko, who is renowned for Dollfie Dream® make-up, was in charge of the master make-up design. Her unique feel is so attractive!! The DDS Body was picked for her in order to express the height difference between herself, Moe and Natsuki. Moreover, her body is a revised version, improved at several areas based on the opinions we received at the “DDS Pre-Exhibition”. The “S Bust” has been chosen for the first time for the DDS. Of course, the sculpt of it is completely new. Her childlike ambience is precisely recreated. * DDS Akira has Play-Rock-Hand Parts(DD2 H-7). Other hand parts are not included.